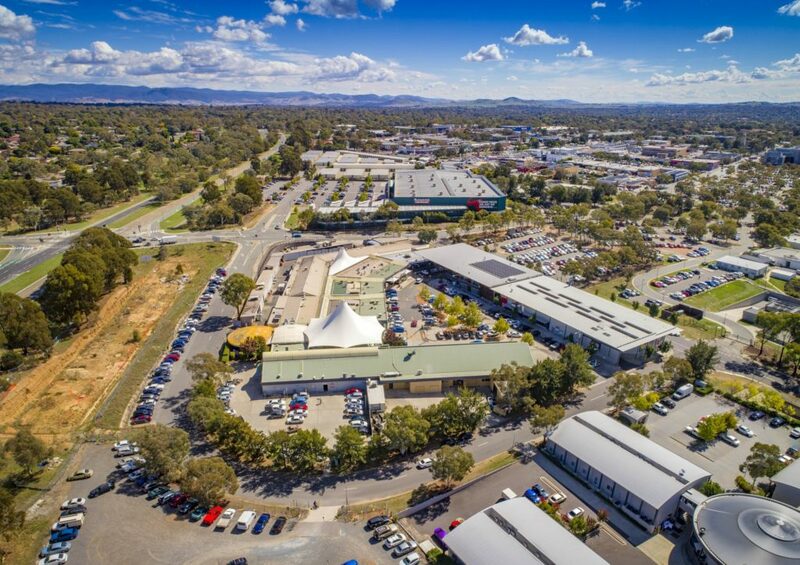 In March 2019 the ACT Government released the Kippax Master Plan and DV 361, the associated Draft Variation to amend the Territory plan, required for the public open space to be sold off for use as a shopping centre. Documents relating to the process and the community responses, are available here. 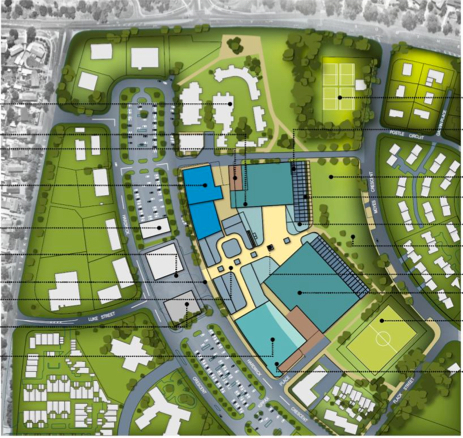 The Belconnen Community Council (BCC) strongly opposes this development application (DA) for a lease variation (LV). This DA for a LV does not meet the expectations of the community at large. The proposed fast food takeaway drive through facility is inappropriate for the location, and contrary to the expectations of the community following the release of the updated Belconnen Town Centre Master Plan (the master plan). It would also create significant traffic issues on a problematic corner. The concerns raised regarding a drive through takeaway fast food shop on this heavily trafficked corner block are significant. The BCC has spoken to the community, local sporting bodies and government agencies that share our concerns. 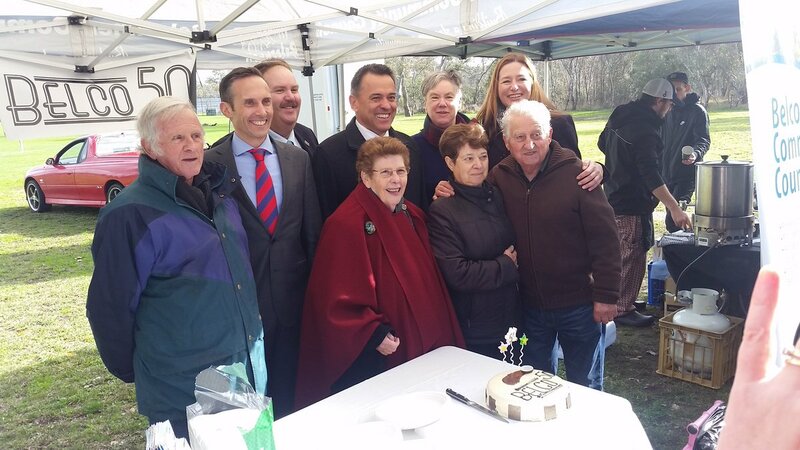 The recently released master plan is the result of the most extensive community consultation process undertaken by the ACT Governments Environment and Planning Directorate (EPD) for any master plan to date. In both the draft and final master plan process, EPD received more submissions from the public and community groups than any other master plan. 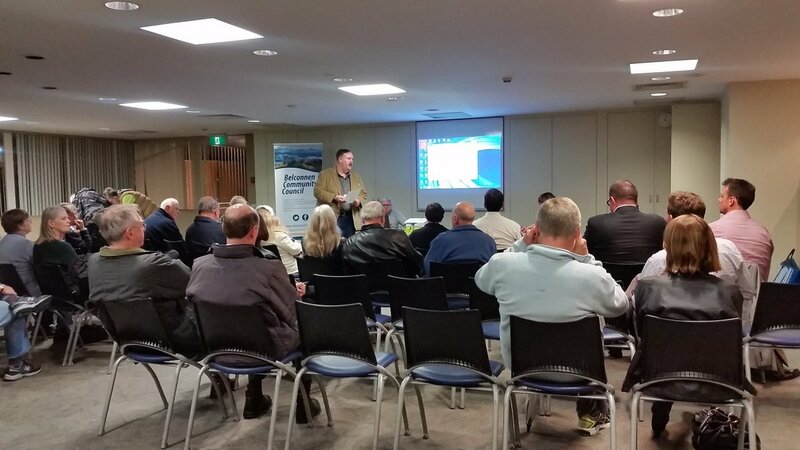 In the many public meetings and information sessions held by both EPD and the BCC during the consultation process, it was clear that Emu Bank was important to Belconnen residents, workers and visitors. The master plan creates a vision for future development in this area that would address the frustrations people identified with Emu Bank, and enhance the aspects that the community loved. A strong aspect of the new master plan is to provide an incentive for property owners along Emu Bank to relocate fast food drive through businesses to other more suitable locations in the town centre (such as the services and trades area), that are better served by suitable road access for the types of traffic that drive through fast food outlets create. The precinct code governing permitted development is about to be updated and is in draft form right now. The community consultation process is due to begin shortly. The development on this corner would not be approved under the proposed precinct code, based on the community expectations that the new master plan has created, and the vision of Emu Bank that ACT Government planners have presented to the community. However, as ACTPLA determined in late 2017, the previous DA for this development, DA 201630298, did not comply with the current precinct code. 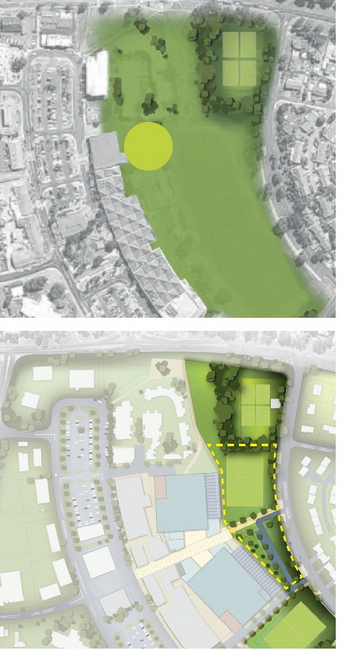 The proposed use is a fast food takeaway drive through facility. That proposed use is inconsistent with the use of that site. Approving a lease variation for that site, making a fast food takeaway drive through possible would be a disastrous planning outcome and should not be approved. A LV to allow a fast food takeaway drive through facility is contrary to everything the community expects. People must have faith that the views they expressed through the master plan consultation process, and submissions to ACTPLA on DA201630298 have been considered properly. ACTPLA determined in late 2017, the previous DA for this development DA201630298 did not comply with the current precinct code. Despite ACAT’s legalistic view, A LV is not a simple paper exercise; it is a fundamental change to the future use of a piece of land. 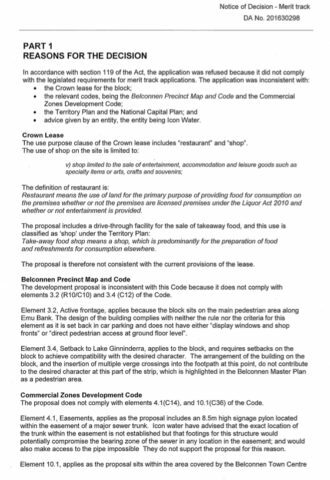 That use has been determined by previous planning exercises including the 1998 Lakeshore Master Plan, the 2001 and 2014 Belconnen Town Centre Master Plans, and the 2017 (draft precinct code) to not be suitable for a fast food takeaway drive through facility. The proposed use is historically inconsistent with the permitted uses of that site. The limited road width is a concern if drivers seeking to access the site are travelling in the ‘wrong’ direction, undertaking a U turn further along Emu Bank will be quite dangerous. The existing fast food drive through locations already create traffic bottlenecks, another is not required and is contrary to the ACT Governments expressed desire to address traffic issues along Emu Bank by encouraging existing fast food drive through businesses to relocate. In vehicle number calculations, the traffic report doesn’t take into account developments already underway at the corner of Eastern Valley Way and Aikman drive, with 331 new apartments expected to house over 500 cars. 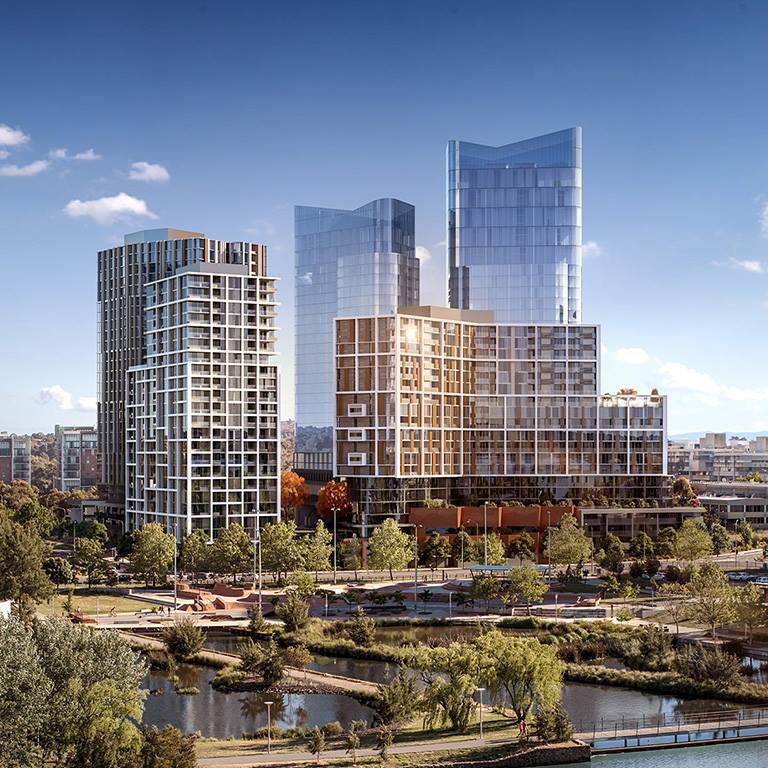 There are further apartments to be built in this area including the Section 200 complex of residential towers, and the two apartment blocks on Emu Bank immediately in front of the Westfield carpark facing Lake Ginninderra. Residential development will also be built along Aikman Drive. All this extra traffic will impact Emu Bank and the entrances proposed in DA201630298 will only create traffic issues on this problematic corner. Public transport and heavy vehicles interactions do not appear to have been given a reasonable level of consideration in DA201630298. The site is directly opposite a major public transport facility entrance with hundreds of movements a day running past the proposed entrance or exit. Light rail, when built, will also pass this corner. DA201630298 also makes it clear that cyclist and pedestrian access to the site is secondary and not well planned in relation to the drive through aspect. This is of concern given the target market is clearly reliant upon children at the skate park and the high school only 100 meters away. Frontage to the skate park is highly problematic. Community expectation around the Belconnen Town Centre Master Plan process indicate that Emu Bank problems must be addressed, not added to. The drive through aspect of the proposal will locate extra driveways very close to the corner of a road that carries enormous volumes of traffic. The fast food drive through further along Emu Bank already creates traffic issues. Access by trucks seeking to service the proposed facility will create dangerous traffic issues. The entrance/exit is directly opposite the Belconnen bus interchange exit, impacting public transport, and may impact future light rail routes through the Belconnen Town Centre. Access by pedestrians or cyclists to the building is perfunctory, with the drive through customer aspect predominantly catered for. Frontage to the Skate Park is problematic. The new Master Plan suggests redirecting traffic away from Emu Bank. This development designed for people in cars to drive through and not stop, conflicts with the ACT Governments intentions. Emu Bank already has disaggregated car parking with many confusing entrances and exits. This development proposes to add two more in the worst possible location. 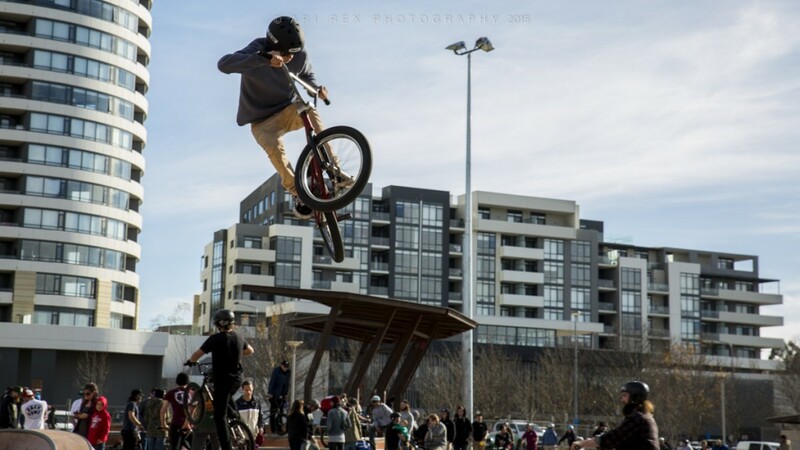 A further observation unrelated to planning, but clearly felt by the Belconnen community, is that the ACT government advocates healthy lifestyles. Permitting a fast food outlet next to a skate park used almost exclusively by youths, and so close to a high school, conflicts with this intention and undermines active living programs aimed at reducing obesity. 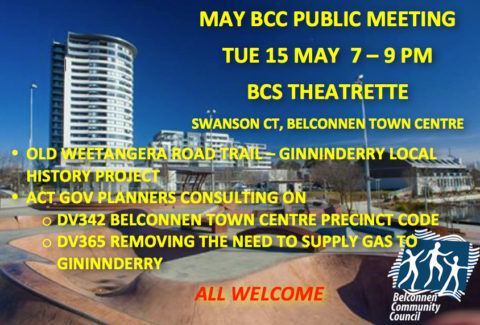 The BCC rarely oppose private developments taking place in Belconnen. In this instance the proposed DA for a lease variation is highly inappropriate and should not be approved. The site is problematic and that is borne out by several failed and lapsed DA’s that precede this one. ACTPLA were correct in not approving DA201630298. 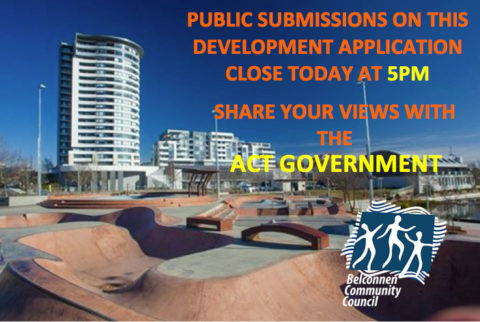 The BCC recommend that this block be acquired by the ACT Government and incorporated into the existing skate park or turned into some much needed green space for the future residents of the high-density residential accommodation planned for the area. Emu Bank has great potential that is currently not best realised. The new master plan has created great expectations in the community that the poor planning decisions made in the past, that have led to the problems along Emu Bank today, can be resolved over time. The BCC request that this LV is not approved. Approving this LV would conflict with the vision contained in the new master plan, and be contrary to community expectations. 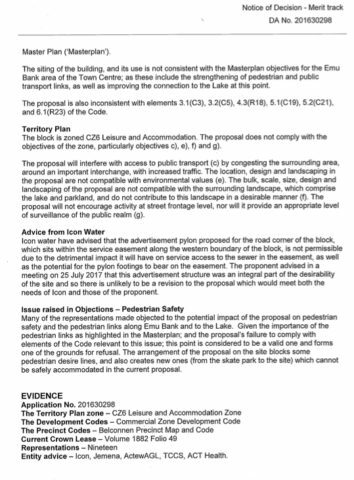 The BCC rarely oppose Development Applications. Hundreds are approved every year and people get on with making Belconnen a better place to live and do business. Occasionally a proposal lacks merit and is inappropriate, or has issues that could be resolved with consultation. 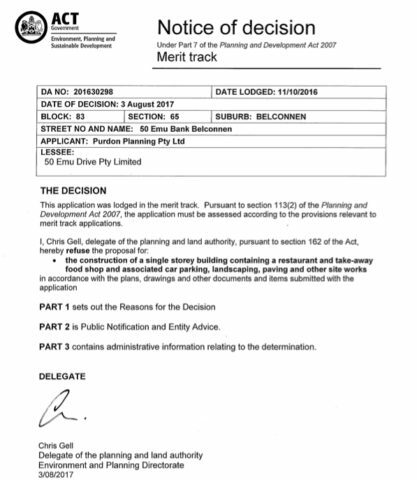 Late last year DA201630298 was lodged to build a drive through takeaway restaurant on Emu Bank, next to the Belco Skate Park. 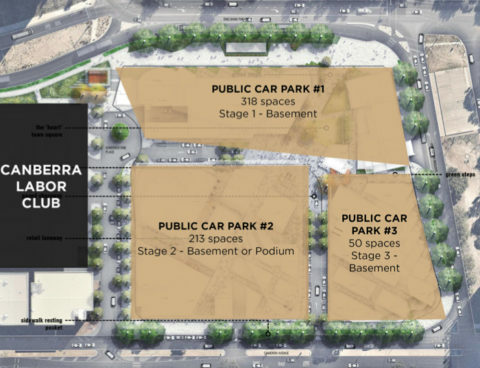 It was an inappropriate proposal for this site and inconsistent with the direction of Emu Bank, that became clear through the extensive community consultation process for the Belconnen Town Centre Master Plan. 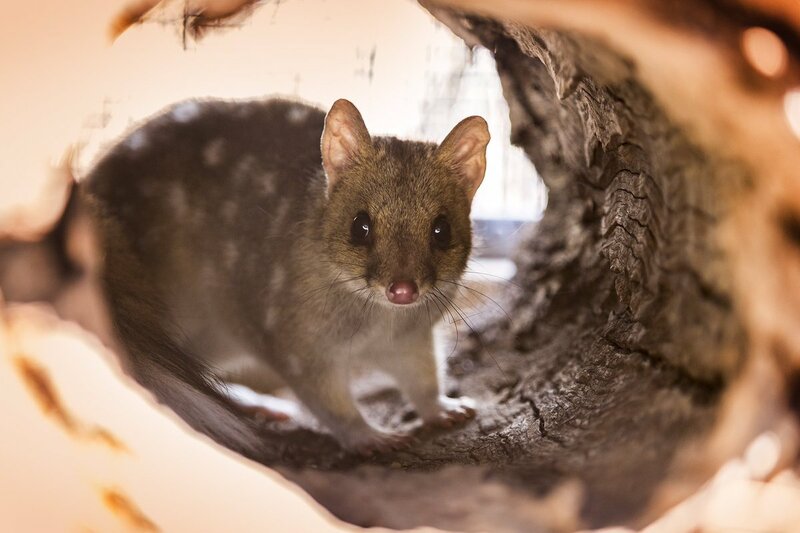 The BCC, and many residents in Belconnen, made submissions to Environment, Planning and Sustainable Development about the DA. Our submission can be found here. On August 3 2017 the BCC were advised that DA201630298 has been refused. The DA was inconsistent with the Master Plan objectives. It’s always refreshing when people see the planning system work well.